Andrew Airlie is the Indiana Jones of Canadian spies in The Romeo Section | TV, eh? 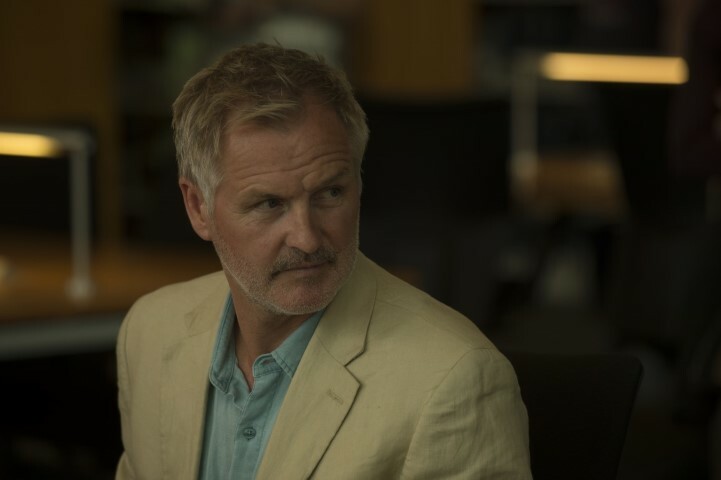 If a show was shot in Vancouver, there’s a strong chance Andrew Airlie has appeared in it. The Glasgow-born, Toronto-educated, Vancouver-resident Airlie has starred in Reaper, Defying Gravity, Cedar Cove, The Killing, and Chris Haddock’s Intelligence, among many others. And he’ll always also be orange guy from the House pilot to me. His starring role in Haddock’s CBC homecoming, the Vancouver-set spy drama The Romeo Section, feels like watching an actor at home in his setting as well as in his character Wolfgang McGee’s rumpled linen suit. I talked with Airlie on location during the last day of filming the first episode, at the beautiful St. Andrew’s-Wesley United Church downtown. He revealed we had our own spy-like connection: he’d learned of a potential new Haddock show on CBC from an anonymous tip I’d shared on the TV, eh? Twitter account. My set visit was embargoed so it’s only now I can reveal my own secret: I got a sneak peek of the scene in Wednesday’s premiere where Wolfgang strides wordlessly down the aisle of the church, a woman cleaning in the foreground. Spoiler alert. Airlie did spill a few more details of the intricately serialized show. My take is that McGee is like the Indiana Jones of Canadian spies, minus the running from boulders – professor by day, independent intelligence contractor by other parts of the day. The first episode doesn’t spell things out for the audience, but the premise of the show is promoted as McGee managing “Romeo and Juliet spies” — informants engaged in intimate relations with intelligence targets. The Vancouver on display in The Romeo Section so far looks beautiful, with fewer gritty corners than Intelligence, more gleaming buildings and scenic backdrops, but there’s a similar underbelly slowly being revealed in the spy drama. Airlie is gracious about my continued association of him with House, too, despite it being a one-shot guest appearance. “I could tell when they were making that pilot it was going to go big,” he said. “The writing was extraordinary, and Hugh (Laurie) was great, as was Lisa (Edelstein).” Coincidentally, Airlie’s son has acted with both Laurie, in scenes that were cut from Tomorrowland, and Edelstein, with a recurring role in her Girlfriend’s Guide to Divorce. The Romeo Section showcases Airlie’s talents far more than that memorable but brief role, however. Both Airlie and Haddock have confidence that CBC audiences will gravitate toward it, and CBC has given them every reason to believe the broadcaster has confidence in the show. The Romeo Section airs Wednesdays on CBC.